There’s a baby on the way for one of Teen Mom OG‘s new stars — Bristol Palin’s ex Levi Johnston! Levi’s wife Sunny Johnston broke the pregnancy news with a super cozy holiday themed family photo, including Bristol and Levi’s son Tripp. 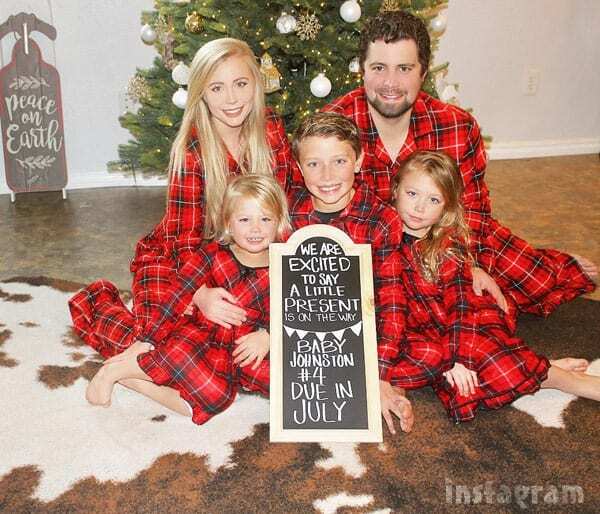 “We are excited to say a little present is on the way,” Sunny captioned the photo, in which the entire family is wearing matching red and black flannel pajamas. “Baby Johnston #4 due in July!” she added, along with this string of emoji: ❤️???? The chalkboard in the picture reveals that the baby is due in July. As Sunny mentions, the new addition will be the fourth child for the family, the third for Levi and Sunny — who have been married just over six years. The couple welcomed six-year-old daughter Breeze Beretta Johnston in September of 2012, and three-year-old daughter Indy Rae in January of 2015. Levi and Bristol share almost-ten-year-old son Tripp, who was born on December 27, 2008. Dang that crew is photogenic — whether in coats or PJs! Congratulations to Levi and Sunny! I have to say that when I first heard that Levi was going to be on Teen Mom OG with Bristol, I grimaced a bit because all I knew of him was the over-the-top drama of his on-again, off-again relationship with Bristol many years ago. But, Levi has come across as completely level headed and mature this season, including the scenes with Bristol about signing a contract for their son Tripp in which Levi calmly called out Bristol for seemingly misrepresenting the situation. He reminds me of Teen Mom 2 dad Corey Simms, to be honest. I’ll admit that I am curious to see a little more of Levi, Sunny, and their family — especially in Alaska. Crazy Days and Nights reported earlier this year that Bristol Palin was hoping for her own spin-off show, so perhaps we will be seeing more of Levi and Sunny soon? So far there has been no public reaction to Sunny’s pregnancy from Bristol. Who’s the father of Mindy Kaling’s baby?